The Delaware Water Gap Celebration of the Arts (COTA) is proud to announce that it has selected the artwork of Tim Helman, as the winner of the 2014 poster competition. Helman, a Pocono native, has been a visual artist for more than thirty years, painting in three-dimensional mixed media, incorporating musical instruments and found objects into his art. His style is innovative and unique and has been exhibited in the Bixler Gallery, Sweet Creams Café, Designer Crafts on Main, the Willowtree Inn, and the Red Run Gallery, to name a few. Throughout his career he has been commissioned to do face and body painting by numerous festivals and several private gatherings in the Tri-State Area, including the Knowlton River Festival and the Celebration of the Arts. In the past, he has also done airbrushed body art for the ESPN/EXPN X-Games. He has won many awards at the Music Motif Art Show at the COTA Jazz festival and in 2004, was the recipient of the COTA Volunteer of the Year Award. He is also the Director of the Artisan Area at the COTA Festival itself. Additionally, his work is currently displayed in many private collections across the country. The poster competition is held annually and is open to all visual artists. The poster is widely displayed throughout the Tri-State area, and is the primary marketing tool of COTA. 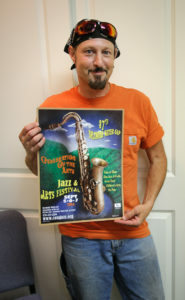 In addition to the poster, the design is used on the official COTA t-shirt, as well as the brochure and printed program. COTA is an all-volunteer jazz festival, started in 1978, which presents local jazz talent to the community. In the following 37 years it has grown into a 3-day event featuring 16 bands, theater and dance a musically themed art show, food vendors from area restaurants and non-profit organizations and local artisans selling their handcrafted wares. The festival is held in Delaware Water Gap every year the weekend after labor day. The festival this year is September 5, 6 and 7. The 37th Annual Celebration of the Arts will feature the music of Bob Dorough, Vic Juris, David Liebman, Nellie McKay, Sherrie Maricle & the Diva Trio, Najwa Parkins, Tim Carbone, the COTA Cats, the big band sounds of Phil Woods and the COTA Festival Orchestra, and much more. For additional information about the COTA festival, the full schedule and advance ticket sales please visit cotajazz.org or contact COTA at (570) 424-2210. 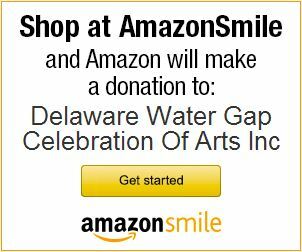 The Delaware Water Gap Celebration of the Arts is a non-profit 501c-3 presented in cooperation with the Borough of Delaware Water Gap, Castle Hill Development, Inc, and the Delaware River Joint Toll Bridge Commission.